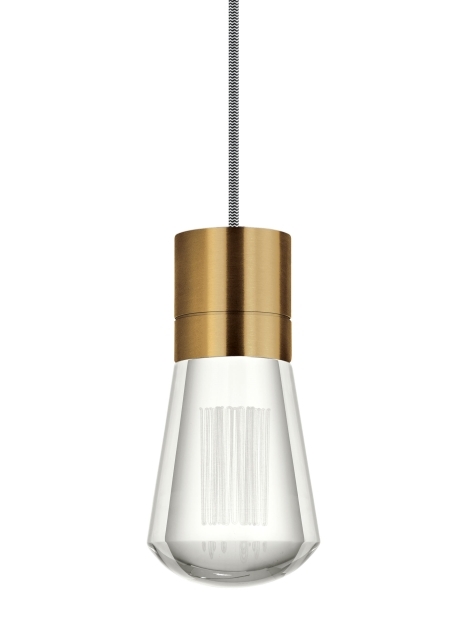 The Alva pendant, by Tech Lighting, is a classic Edison-style squirrel cage lamp reincarnated as a modern socket and cord-style LED pendant light. Alva features a powerful downward-firing LED that is smartly hidden within the "socket" then combined with a solid "bulb" of pure optic crystal. Intricately detailed "filaments" are laser-etched into the crystal for a visually intriguing light fixture. With a modern take on the cord-style trend Alva is customizable to your style. Choose from three finishes and eight cord colors to match any décor in your kitchen, bathroom and living room. Also available as a 3-, 7-, and 11-lite chandeliers (canopy included).